The role and function of the nurse is rapidly changing. Some nurses are now required to undertake clinical diagnosis of the patient, a responsibility traditionally undertaken by a doctor. Clinical Diagnosis helps prepare nurses to fulfill this role, providing them with the skills and underpinning knowledge to make clinical diagnoses of patients effectively. 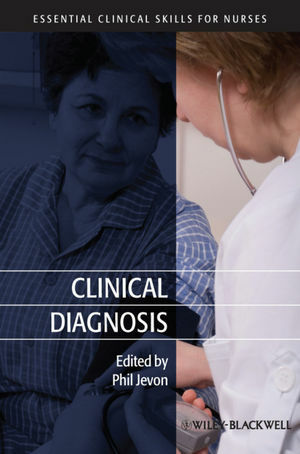 Each chapter follows the same layout for each symptom or sign, exploring the definition, causes, history, precipitating factors, associated signs and symptoms, important considerations, relevant clinical examination, and investigations and tests. Phil Jevon is Resuscitation Officer/ Clinical Skills Lead at The Manor Hospital, Walsall. He runs and directs the Resuscitation Council (UK) ALS, ILS, EPLS Courses and still works regularly in the clinical area. A key part of his role is to provide simulation training for medical students on SIMMAN in clinical examination/diagnosis skills – he has recently been awarded honorary Clinical lecturer in recognition of this work. 1 An Overview to Clinical Diagnosis (Phil Jevon). 2 Clinical Diagnosis of Symptoms Associated with the Respiratory System (Gareth Walters). 3 Clinical Diagnosis of Symptoms Associated with the Cardiovascular System (Jonas Mhando and Phil Jevon). 4 Clinical Diagnosis of Symptoms Associated with the Gastrointestinal System (Yang Ng). 5 Clinical Diagnosis of Symptoms Associated with the Neurological System (Kathryn Blakey and Gareth Walters). 6 Clinical Diagnosis of Symptoms Associated with the Musculoskeletal System (Michael Parry). 7 Clinical Diagnosis of Symptoms Associated with the Genitourinary System (Dev Mittapalli and Dev Mohan Gulur). 8 Clinical Diagnosis of Symptoms Associated with the Ears, Nose and Throat (Dev Mittapalli).